The Adventure Bible Bible Story Collection is a six book treasury of level 2 Adventure Bible I Can Read titles designed for newly independent readers and based on the Adventure Bible—the #1 Bible for kids! 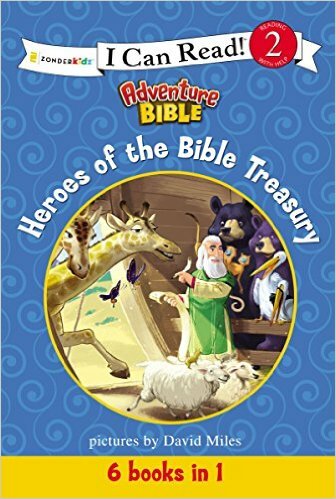 Heroes of the Bible Treasury is an awesome book for kids! 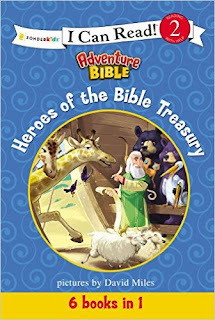 Heroes of the Bible Treasury is a level 2 I Can Read Book and perfect for newly independent readers. My daughter absolutely loves that there's six books in one so she can pick out a new one to read each time. Her favorite thing about Heroes of the Bible Treasury is that she can read them on her own with very little help from me. She picks Heroes of the Bible Treasury out to read every night before bed and practices reading. If you're looking for a way to encourage kids to read, this is it! The illustrations are incredibly fun and vibrant making reading this book a blast. You can find Heroes of the Bible Treasury (I Can Read! / Adventure Bible) on Amazon, Barnes and Noble and other bookstores.